The risk landscape in the mining sector has become significantly more treacherous during the past year according to the Global Mining & Metals Team at Ernst & Young. 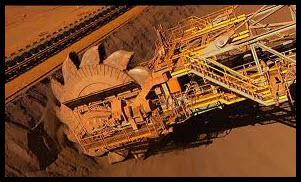 It is certainly not news that mining is one of the riskiest commercial endeavors conceivable. 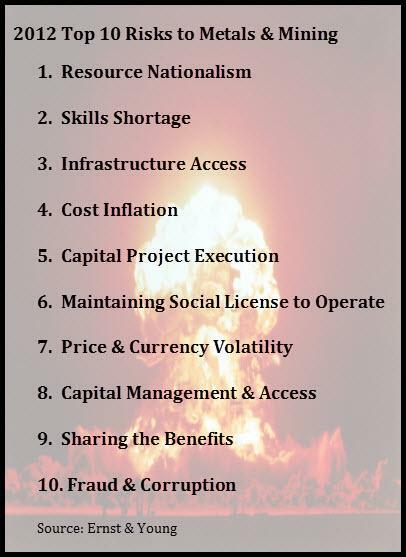 However, the intensity of the risk environment can vary like the temperature in an oven, as highlighted in the just released E&Y report identifying the top 10 risks facing miners in 2012. For the second year running, the E&Y report identified Resource Nationalism as the number one risk faced by mining concerns. This risk factor leapt to the top spot two years ago from fourth place as national governments have sought an ever increasing piece of the pie during a period of surging mining profits derived from the decade-long bull market in commodities. The report highlights three key developments that characterize government advances on the industry beginning with the new imposition of or increase in revenue royalties and income taxes. A second development is the imposition of new or increased national ownership requirements. These are often free-carried interests, meaning the mining company bears 100% of the costs and the government gets its interest for free. In extreme cases we are seeing outright nationalization. These first two are certainly onerous but not necessarily new in concept. The third development adds a new wrinkle to risk assessment. Some countries are implementing beneficiation requirements and export taxes or outright export bans on unprocessed raw materials. Beneficiation refers to the refining of unprocessed raw materials. The purpose is to force lucrative mining sectors to develop refining and smelting operations in-country, which will lead to the higher-value export of refined commodity products. This in turn, it is hoped, will lead to increased domestic revenue from mining activities, increased tax receipts to the state, new industries and job creation, infrastructure development, the preservation of mineral resources and economic growth in general. Perhaps surprisingly, these trends have emerged in mining powerhouses such as Australia, South Africa and Peru in addition to smaller but significant mining jurisdictions like Argentina, Mongolia and Bolivia. "…the combined planned five-year $200-billion capex spend of the five main London-listed mining majors is coming under downward pressure from investors…"
BHP Billiton, the largest diversified miner on the planet, highlighted the current mood among mining companies by canceling a 5 year US$80 billion capex program that had been announced in February 2011 by CEO Marius Kloppers. In May, Chairman Jacques Nasser, reversed course indicating that the global powerhouse would not spend US$80 billion on growth projects as previously stated. He indicated that "…when the CEO talked about that $80 billion … the environment was different…"
Similar moves by the other majors will have a significant impact on the economic growth and government revenues of countries where they operate. Viewed in this context, the rise of Resource Nationalism appears short-sighted as it is having the opposite effect of what was intended. "The focus is shifting from a rapid increase in production capacity to careful evaluation of capital projects in an environment of heightened volatility." As is often stated, mining is a capital and expertise intensive industry requiring lengthy periods of time, measured in years, to get from exploration to production. The dramatic retreat of investor and company capital, in the face of real or perceived risk, will significantly retard discovery and production, the longer this capital starved climate lasts. Demand, however, is a fickle thing and can rise or fall much faster than supply can adjust to match it, having important implications for prices. We are not convinced that global resource demand has or will contract nearly as dramatically as capital markets have in the mining and metals sector over the past 15 months. In fact, we feel, along with many others, that the retreat is significantly overdone relative to fundamentally sound prospects for global demand going forward. "PwC mining industry leader for Africa Hein Boegman said…that demand remained robust, and long-term growth in emerging markets was more significant to the mining industry than short-term jitters in the developed world." Therefore, we believe the stage is being set for a revived rise in commodity prices as supply is being constrained by elevated risk while global resource demand remains stealthily robust.